Darn weather! This thing would be done and I could have moved my lettuce outside if only the weather would cooperate. LOL, just another day I guess. I can’t complain too much. If we were having a normal winter I would still be planning this out and looking forward to starting it. 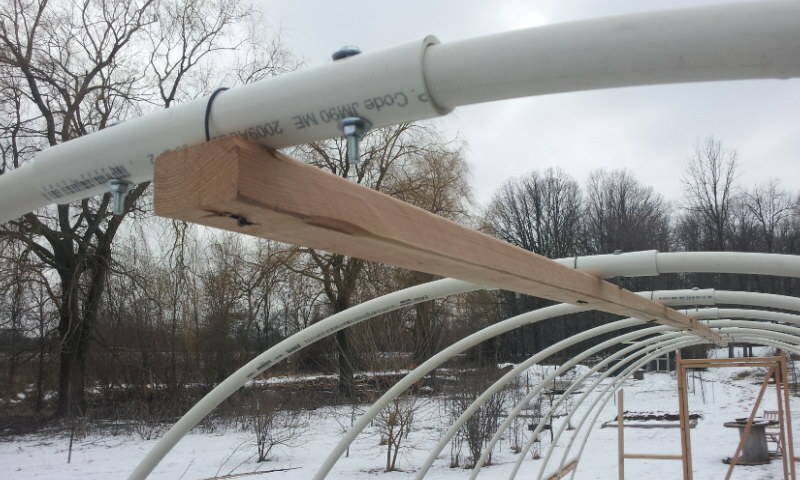 The last update showed the boys screwing the pvc posts into the wood runner on the long side of the hoop house. If you haven’t seen the start of this project you can find it here. Since then we put on the hip boards. Mine are 30″ from the top of the runner board. I did this in such a way that I can have my sides roll up for ventilation and cooling and it can rest on this board I’ll have a picture of that when I get it all done. These boards (2 x 4 x 8) are drilled out with a 1″ hole saw so the pvc sits in the board. I then used a 2″ screw to secure the pvc to the board. 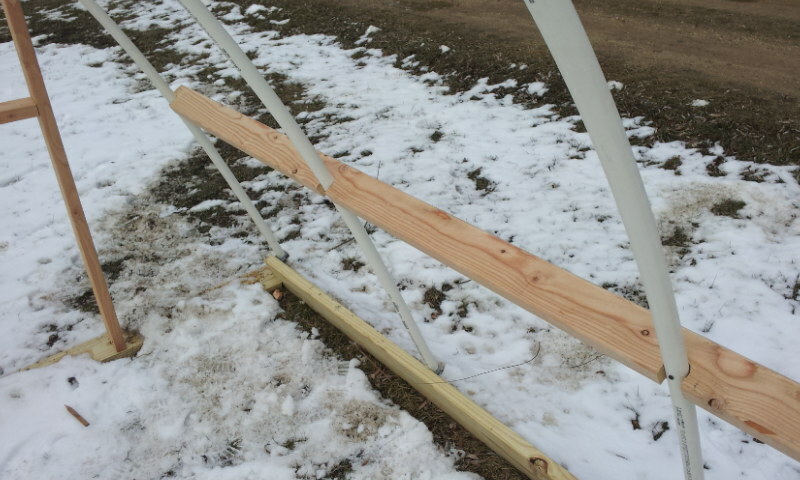 The part of the board that is outside the pvc will become the shelf that the rolled up plastic from the sides rests on. At least I hope so anyways. We also built one of the end walls. Just standard framing. Actually the other end is going to be built a little different just to see which way works better. The lumber is standard 2 x 4 x 8’s. My door is 36″ wide and just shy of 6′ tall. The last thing we have completed is hanging the ridge pole. Standard 2 x 4 x 8 boards. The way I hung this is I drilled 2 small holes through the board and used some 14 gauge wire that I had for another project and just twisted it. Just link a twisty tie. The twists are on the bottom of the board so it doesn’t contact the plastic. The black wire is coming around the pvc and into the wood, then twisted tight. 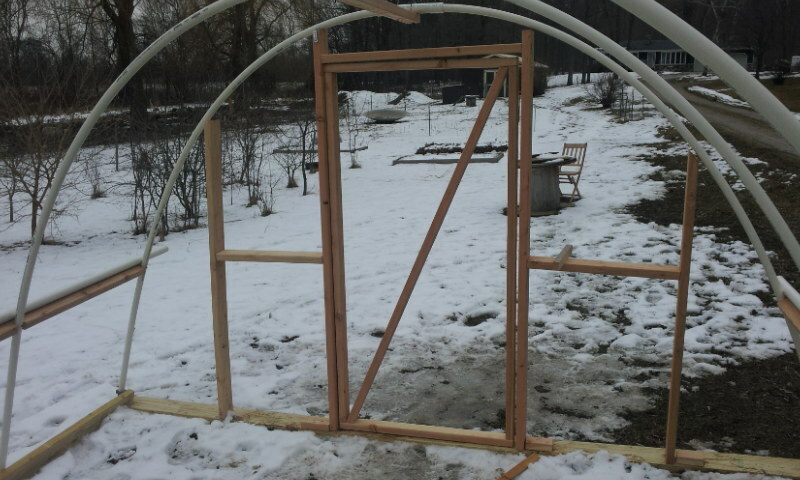 Today most of the snow is gone but it is very windy so the plastic won’t be installed. Maybe tomorrow I can get the other end wall installed and the plastic on! 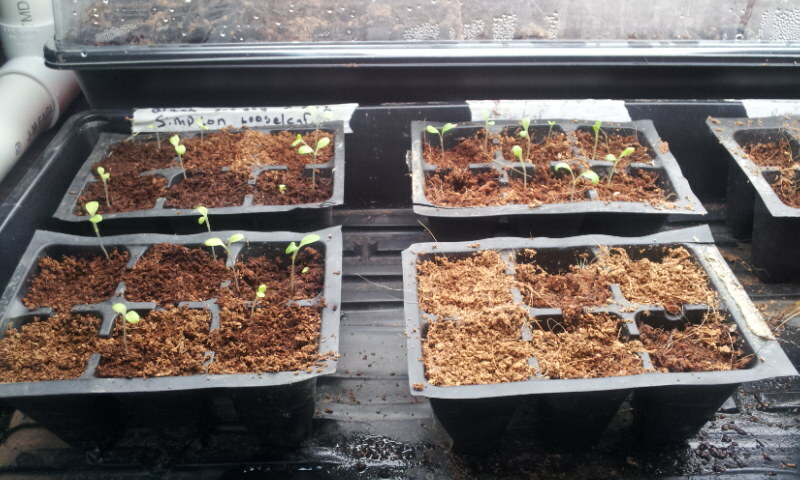 This blog will be an ongoing diary of my lettuce plantings this spring. I always start off the gardening season with a notebook and the intention to document everything I do in the garden. The intentions fade quickly though and eventually nothing gets recorded. I’m hoping that by using this blog I will stick with it longer. 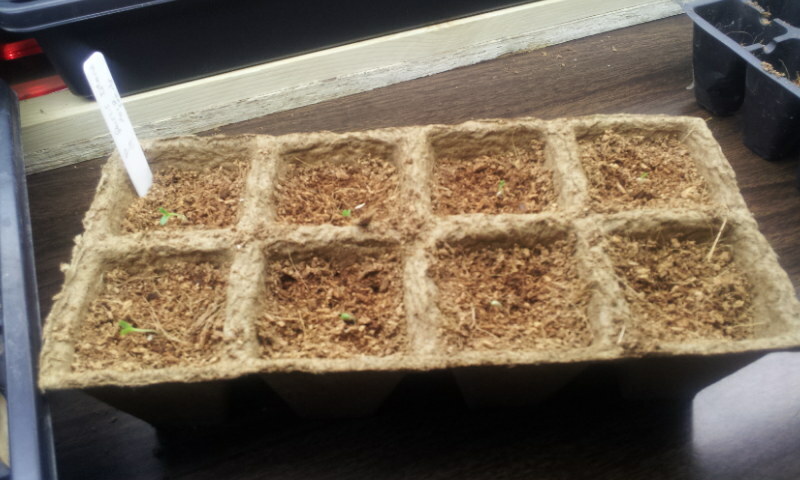 So here starts the lettuce diary! 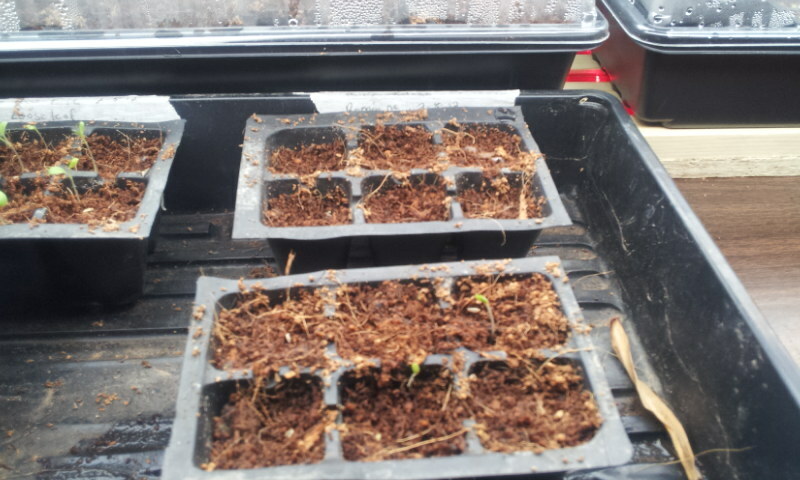 2-8-2012 Me and the kids started 6 varieties of lettuce. These seeds are leftovers from last year. 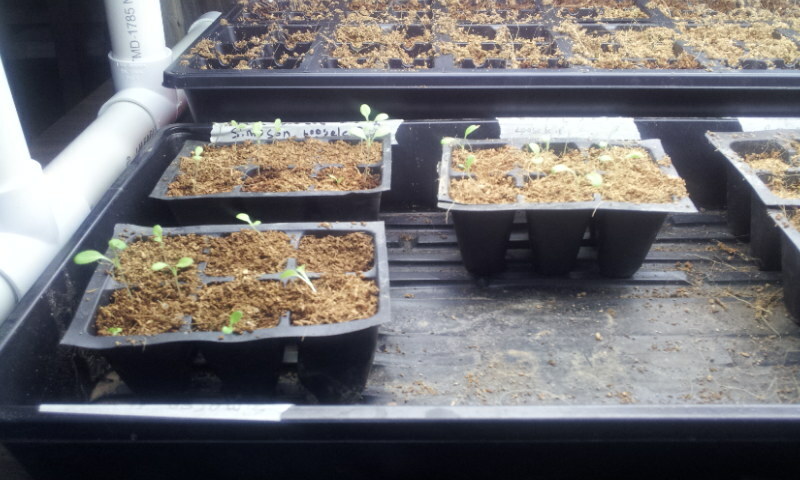 I don’t know how viable they are and since it is just lettuce I am not going to worry about doing a germination test or anything like that. The six varieties are Simpson Elite, Royal Red, Parris Island, Salad Bowl, and Red Fire. 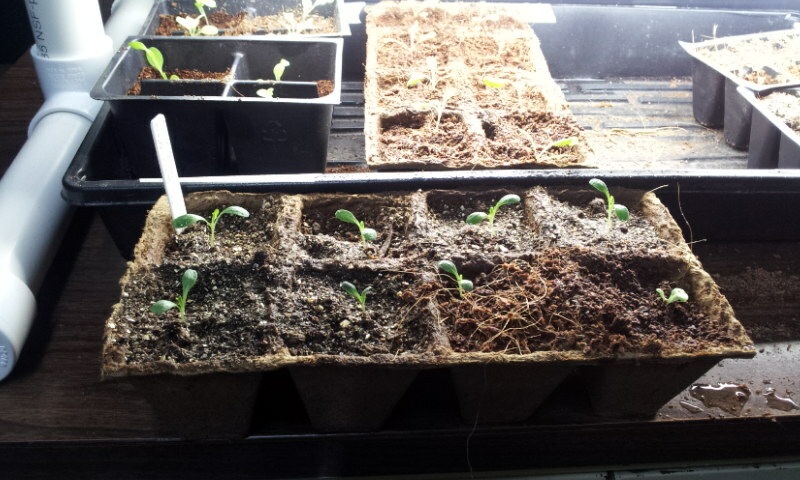 They are planted in Burpee brand seed starting pellets and coconut fiber. 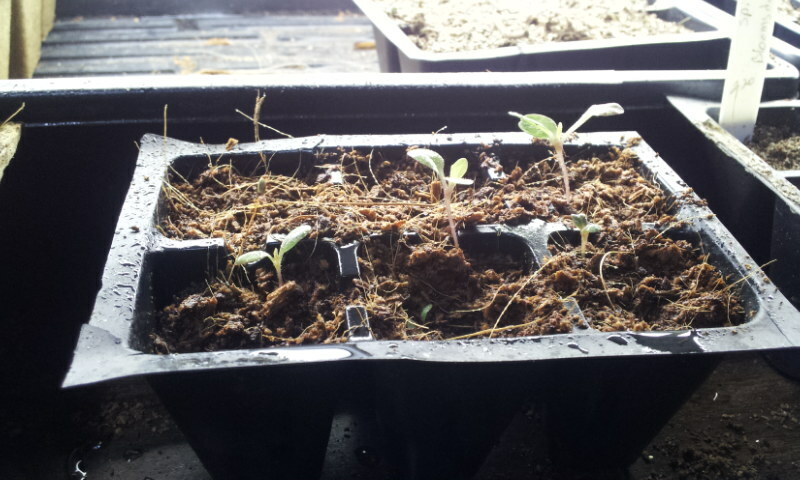 The flat was placed on an east facing windowsill and we had some germination in a couple of days. A side note is that after we planted the lettuce I decided to build a light stand and heat mat. Once that was complete the lettuce was moved to a the light stand, but no heating mat. I believe that was done on the 16th of February. 2-18-2012 Pictures of lettuce today. I discarded the Salad Bowl tray because there was no sign of life. 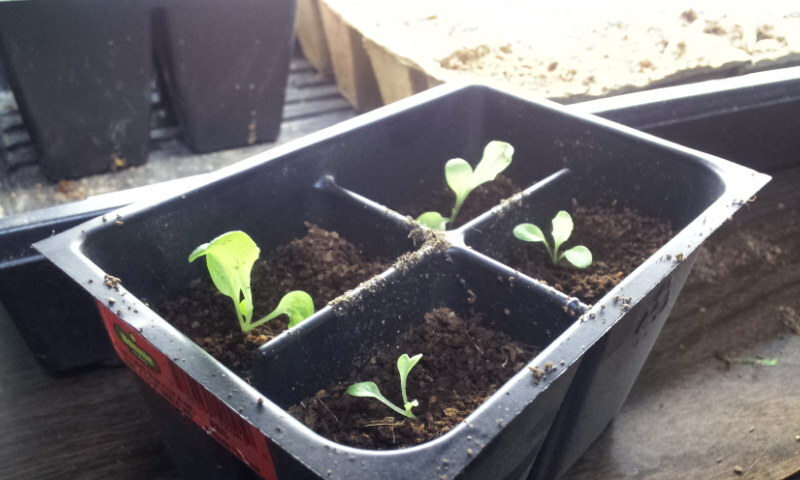 The lettuce seedlings had some white furry stuff on the stalk. It seems like they grow out of it??? I say that because the taller it gets, the less of the white stuff there is. Does anyone know what it is? The soil is a little wetter than I would like and I am currently working on getting it dried out some. I think that is the problem. 2-20-2012 The white stuff appears to be gone. 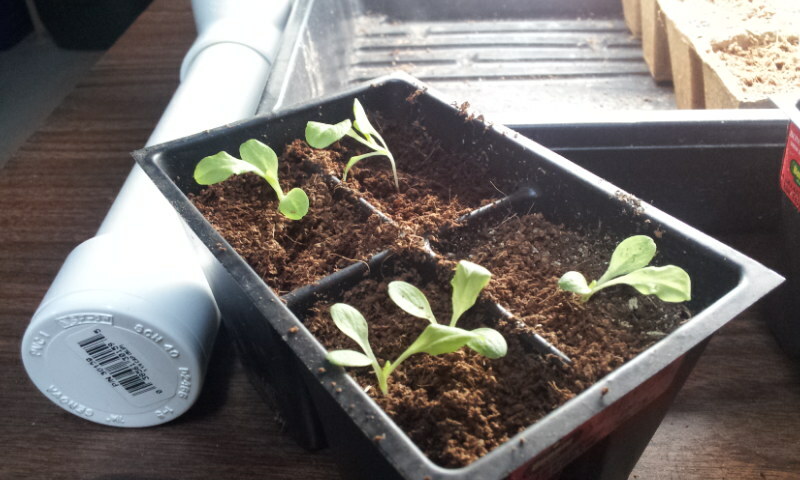 But for some reason two seedlings fell over. 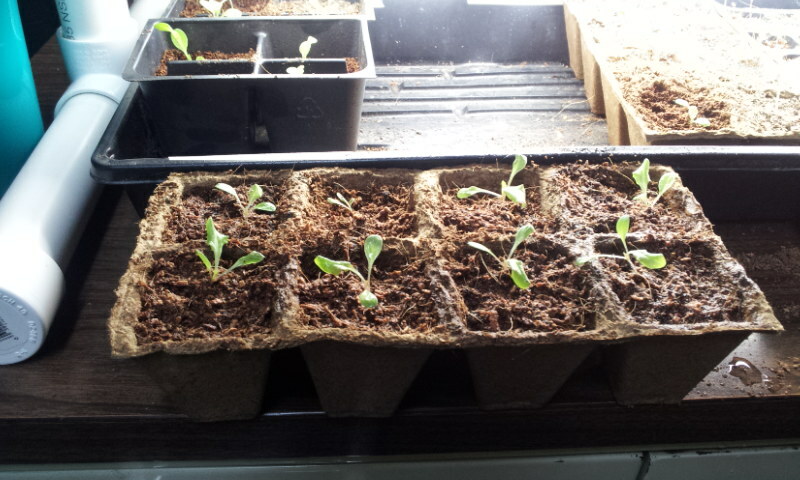 They didn’t shrivel up …yet so I’ll wait to pull them. I’m wondering if I have too much light for them. I turn the lights on for about 12 hours each day. I’ll have to research that and find out what the optimal light time is. The picture below is the Parris Island that did not germinate. Remember this is last years seed. 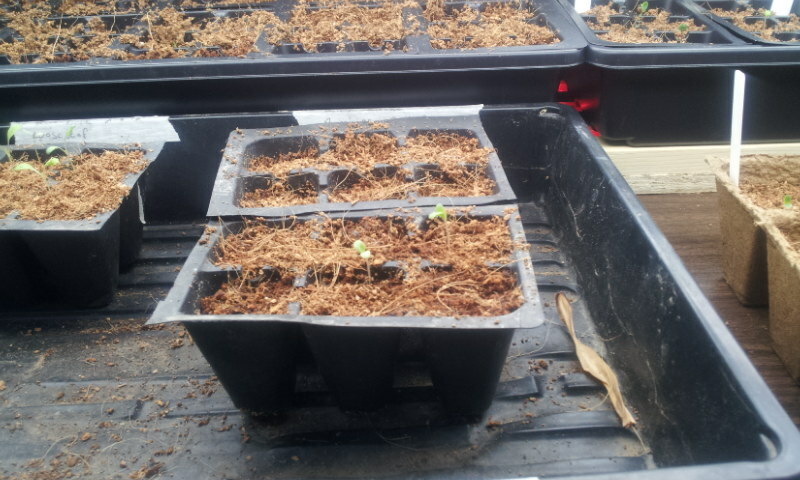 I restarted a new tray with this years seed for Parris Island. Below is the new tray of Parris Island, a Romaine type. Instead of continuing this post any new updates will have their own post. Here is the next update.